A CMOS image sensor is a type of image sensor technology inside some digital cameras, consisting of an integrated circuit that records an image. You can think of the image sensor as being similar to the film in an old film camera. The complementary metal-oxide semiconductor (CMOS) sensor consists of millions of pixel sensors, each of which includes a photodetector. As light enters the camera through the lens, it strikes the CMOS image sensor, which causes each photodetector to accumulate an electric charge based on the amount of light that strikes it. The digital camera then converts the charge to a digital reading, which determines the strength of the light measured at each photodetector, as well as the color. The software used to display photos converts those readings into the individual pixels that make up the photo when displayed together. CMOS uses a slightly different technology from CCD, which is another type of image sensor found in digital cameras. More digital cameras are using CMOS technology than CCD, because CMOS image sensors use less power and can transmit data faster than CCD. CMOS image sensors do tend to cost a bit more than CCD. In the early days of digital cameras, the batteries were larger because the cameras were larger, and so CCD's elevated power consumption wasn't a significant concern. But as digital cameras shrunk in size, requiring smaller batteries, CMOS became a better option. 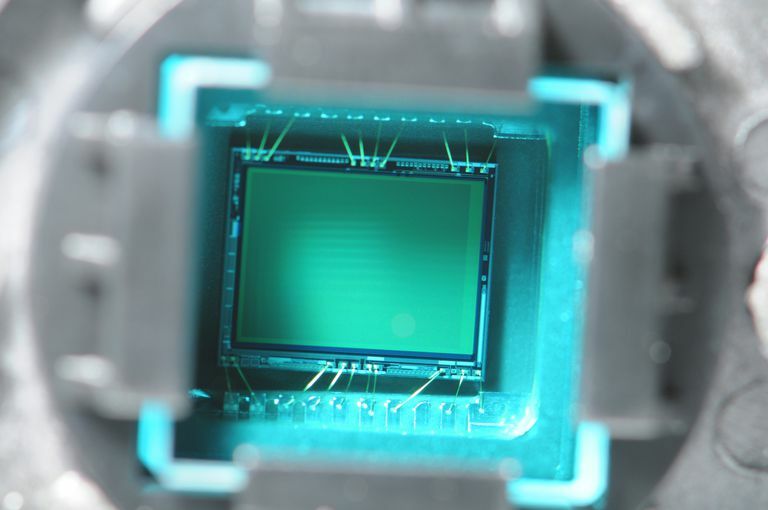 And as image sensors have seen consistently increasing in the number of pixels they record, the ability of a CMOS image sensor to move the data faster on the chip and to other components of the camera versus CCD has become more valuable. One area where CMOS really has an advantage over other image sensor technologies is in the tasks it is able to perform on a chip, rather than sending the image sensor data to the camera's firmware or software for certain processing tasks. For example, a CMOS image sensor can perform noise reduction capabilities directly on the chip, which saves time when moving data inside the camera. The CMOS image sensor also will perform analog to digital conversion processes on the chip, something CCD image sensors cannot perform. Some cameras will even perform the autofocus work on the CMOS image sensor, which again improves the camera's overall performance speeds. As camera manufacturers have migrated more toward CMOS technology for image sensors in cameras, more research has gone into the technology, resulting in strong improvements. For example, while CCD image sensors used to be cheaper than CMOS to manufacture, the additional research focus on CMOS image sensors has allowed the cost of CMOS to continue to drop. One area where this emphasis on research has benefited CMOS is in low light technology. CMOS image sensors continue to show improvement in their ability to record images with decent results in low light photography. The on-chip noise reduction capabilities of CMOS has steadily increased in recent years, further improving the ability of the CMOS image sensor to perform well in low light. Another recent improvement to CMOS was the introduction of back-illuminated image sensor technology, where the wires that move data from the image sensor to the camera were moved from the front of the image sensor -- where they blocked some of the light striking the sensor -- to the back, making the CMOS image sensor able to perform better in low light, while retaining the chip's ability to move data at a high speed versus CCD image sensors.